PARIS, France (PAMACC News) – More finance, capacity building for communities and institutions and use of technology are vital to making Africa adapt to climate change. Speakers during a side event on "Climate Change Adaptation funding in Africa: Experience from the Least Developed Countries Fund (LDCF) and Special Climate Change Fund (SCCF) and African Development Bank (AfDB)" have expressed the need for more money for adaptation and resilience building since Africa bears the brunt of climate change. 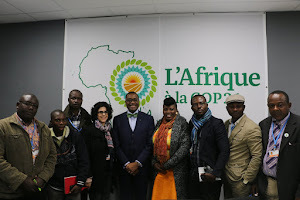 The discussion which took place at the Africa Pavilion at the COP21 in Paris, France and moderated by AfDB’s David Rugamba focused on adaptation financing needs for Africa and innovative approaches to adaptation for the continent. It also focused on building community resilience in a rural to urban development set-up and the role of adaptation using a green economy model. “Africa bears a disproportionate burden of the adverse impacts of climate change. Adaptation is therefore of immediate concern to Africa. It is therefore incomprehensible that of the issues that are so keenly important to the continent would receive such little global attention. OECD has noted that currently, only about 14 per cent of the resources mobilised for climate change is allocated to adaptation,” noted Mr Rugamba, AfDB’s Director of Energy, Environment and Climate Change. The director noted that AfDB has done its part in financing adaption US$2.3billion over the last four years and lauded donors who have channeled finance through the AfDB and Climate Funds hosted by the multilateral development banks including AfDB. “I thank African leadership through Committee of African Heads of State on Climate Change (CAHOSCC) and African Ministerial Conference on Environment (AMCEN) for stressing the urgency of adaptation in Africa. The African Group of Negotiators stands with the Group of 77 and China in calling for the new agreement to include provisions for support to enhance adaptation action and implement approaches to address loss and damage that is not avoided through adaptation,” Mr Rugamba said. David Chama KALUBA of Zambia’s Ministry of Finance and Green Climate Fund (GCF) board member stressed the need for investing in people. “We need to invest in people so that they are able to access risks and be able to determine whether the projects should focus on floods or drought management or be invested in economic projects. This way, funds will not go to waste,” Mr Kaluba said. Fishani Gondwe, Global Environment Facility (GEF) council member for Angola, Botswana, Lesotho, Malawi, Mozambique, Namibia, South Africa, Swaziland, Zambia, Zimbabwe urged African governments to develop rural areas with a view to facilitating the movement of people and their products in order to access markets. “We need to develop infrastructure like roads with good drainage systems to tackle floods, promote tourism and save lives,” Mr Gondwe said. Gustavo Fonseca, Director of Programmes – GEF Secretariat said GEF is helping countries plan on how they use the money they get from the institution. “We have already disbursed $1.6 billion dollars and 30 per cent of the money goes to adaptation. We are targeting to achieve 50:50 ratio for adaptation and mitigation,” Mr Fonseca said. He revealed that donors have pledged $248 million dollars and expressed hope that this will help bridge the gap in adaptation financing. He also thanked the French government for pledging to give 25 million Euros to GEF. Tao WANG, Director of Mitigation and Adaptation – GCF noted that the institution had mobilised $10.2 billion and have embarked on projects meant to combat effects of climate change. “We have accredited 20 national, regional and international entities to help us get this money to the beneficiaries that include LDCs, small island nations and Africa. We want to interact more with credit entities, contributing and implementing countries to make our projects a success,” Mr Wang said. Ingrid Levavasseur from the Directorate General Treasury–France said France is working with adaptation projects should involve communities and the environment and link them to national action plans if Africa is to move towards green economies. All the speakers expressed need for more money to Africa for adaptation, pointing out that the $100 billion dollars already pledged for adaptation and any other funds should be given to Africa. They opposed the idea of 50:50 ration, noting that Africa bears the brunt of climate change yet they contribute less than 4 per cent and that if the continent experiences more than 3 degrees centigrade, more than $10 billion dollars will be required yearly for adaptation.